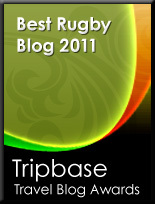 TOTAL FLANKER...a rugby blog: WooHoo! Time for another entirely self indulgent pat on the back as Total Flanker passes the 3000 visits mark. Not earth-shattering news I realise but I've always believed in celebrating life's little successes, no matter how insignificant. Farrell's in and then out, the Aussies hate England, the Kiwis don't want to play in grey, France don't want to play in Cardiff, the Scots are playing up their chances against Argentina and nobody gives Fiji a snowball's chance in hell against the Saffies. There, that's the week's Rugby World Cup quarter final build up summarised in under 50 words. I don't know about you, but for me the week's break in between games now has meant that these last few days have really dragged, with precious little happening to report and complete silence on the tournament from ITV (can you imagine the football World Cup receiving the same treatment?). I realise of course that there'll be plenty to blog about this weekend with the four games coming thick and fast, but there's only so much dissecting of English failure a chap can do and I really don't think I can bring myself to fall to my knees and begin worshipping the supremacy of Southern Hemisphere rugby (they're perfectly adept at doing that themselves). Peterborough RUFC, where I played Colts rugby and a handful of senior games from 1980-83, currently play in Midlands 1 and are 8th in the division after four games. They started the season strongly, winning 27-0 at home to Newport before slipping to defeats against Scunthorpe (23-34), Dunstablians (19-20) and Bedford Athletic (12-41). Today they take on Shaun Perry's old club Dudley Kingswinford at home. Back in my day Guildford RFC was known as Guildford & Goldalming, and I played there in the 1986-87 season, mainly in the lower teams before making the 1st XV in the second half of the season (although I did manage to break my collar bone on my 1st team debut, which wasn't very clever). This season Guildford are in London 2 South (having been relegated from London 1 last season), and lie 3rd after 4 games, with wins against Sidcup (32-17), Dorking (22-13) and Old Colfeians (27-26) and one defeat against Tunbridge Wells (14-21). Today they face a home match against Wimbledon. I joined Ealing in 1988, having moved to West London, and played a couple of seasons there, mainly for the 2nds with a few games for the 1sts. Back then Ealing had just made National League 4 South (as it was then) and faced away trips to the likes of Camborne and Redruth. This season the club are celebrating a return to the National Leagues, having been promoted from London 1 last season, and have started solidly in National 3 South with a draw against Barking (13-13), wins over Bridgewater & Albion (34-10) and Dings Crusaders (37-7) and two defeats against Havant (21-19) and Cinderford (31-52), all of which leaves them 6th in the table. Today's match is away to Rosslyn Park. Barnes RFC is where I probably had my most enjoyable period, playing from 1990-94 in Surrey Divisons 1 & 2. Since I stopped playing the club has enjoyed a rapid rise through the league structure (they've clearly missed me) and are now in their 3rd season I believe in the heady heights of London 1. This season has seen a steady start, being 6th in the table after two wins over Portsmouth (13-3) and Worthing (19-18) and two defeats to Basingstoke (16-23) and Sutton & Epsom (24-38). Barnes take on Shelford today at Barn Elms. So now finally to Chesham, who I've yet to play for but whose Vets' team is scheduled to provide me with my long-awaited comeback game next weekend. Chesham currently play in the pithily-named Berks/Bucks & Oxon 1 North and lie 7th after 3 games, beating Gosford All Blacks 53-0, before losing to Buckingham 3rds (24-29) and Amersham & Chiltern 2nds (10-27). Good luck to Chesham today as they face Beaconsfield 2nds away. Oh, and while I'm at it and for what it's worth, good luck to England today against the Aussies - they sorely need it.